Cathy's Card Spot: Butterflies on brushos. Hi everyone, my stepdad asked me to make a thank you card for the nurses involved in his chemo therapy. He wanted something with butterflies, but on a bigger card. Luckily I had some 5x7 inch bases to use. It's a bit trickier composing something on a bigger base although this die, which is quite large, fits better than on my regular bases! For the background I sprinkled brushos in a couple of blues onto watercolour paper and spritzed with water. The butterflies were fussy cut and coloured with inktense pencils. The sentiment diecut is embossed with black sparkle powder, it's nice and glittery in real life. 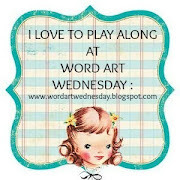 It's also anything goes at Word Art Wednesday. At Stamplorations, the focus is on sentiments. I'm also joining a new to me challenge Make My Monday, where the theme is wet or dry embossing. I've used wet embossing on the butterflies and the diecut sentiment. Hero Arts antique engravings butterfly stamp; versafine ink & clear ep; inktense pencils; brushos; Memory Box thanks die; versamark ink & black sparkle ep; Simon Says Stamp thaks sentiment stamp. This is beautiful, Cathy. The background is super cool. Thanks so much for sharing your wonderful art with us. It's a treat to have you play along. Have a blessed week, and please join us again soon. Beautiful card, Cathy. That blue is phenomenal. Such a lovely card, the blue background really makes the butterflies pop. Such a beautiful card Cathy, the blue background is perfect with the yellow butterflies. I hope your stepfather has a speedy recovery. What a beautiful brusho background! The butterflies just pop against it. I think the nurses will love this and I hope your stepdad is doing well. Your beautiful brushos background looks amazing! When I look at the card, I see wonderful butterflies dancing in the wonderful summer sky! WOW! Absolutely stunning view. Beautiful card Cathy, love this Hero Art butterly and your blue background is amazing.